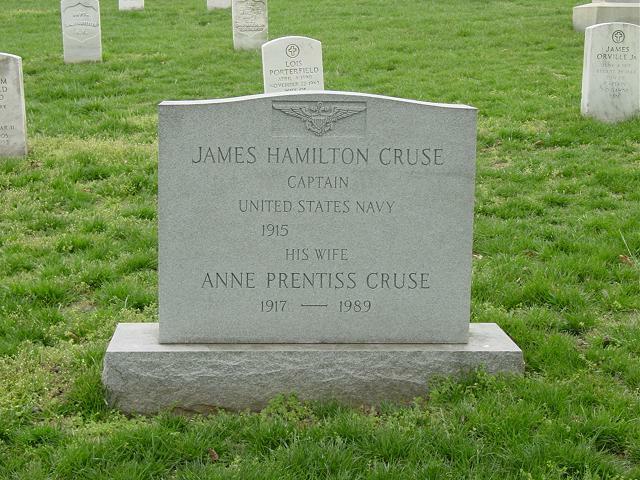 James Hamilton Cruse, 85, a Navy Captain who retired in 1967 and was a construction engineer at Bechtel Corp. in Washington from 1970 to 1984, died of pneumonia July 15, 2000 at Mount Vernon Nursing Home. He was born in Fort Sill, Oklahoma, and was a 1937 graduate of the U.S. Naval Academy. He was a Naval aviator during World War II and in the mid-1940s was executive officer of the Naval Air Station at Lakehurst, New Jersey. His career assignments included commanding the destroyer Harlan R. Dickson in the late 1940s and teaching at the Naval War College in Rhode Island in the late 1950s. His final assignment was as faculty adviser at the Inter-American Defense College at Fort McNair in the 1960s. He was a member of Army-Navy Country Club in Arlington. His wife of 50 years, Anne Randolph Prentiss, died in 1989. Survivors include two children, James Cruse Jr. of Richmond and Susan Peyton Cruse of Staunton; a sister; and a brother. A daughter, Anne Randolph Cruse, died last year. NOTE: Possibly the son of Fred T. Cruse, Colonel, United States Army. Of Arlington, Virginia. Husband of the late Anne Cruse; father of Jay and Susan Cruse; brother of Thomas Cruse and Helen Lemberger. Funeral services will be held on Monday, August 14, 2000 1:00 p.m. at Ft. Myer Old Post Chapel. Interment Arlington National Cemetery. In lieu of flowers memorials may be made to The National Right to Life, 419 7th St., NW, Washington, D.C. 20004-2293.